French President Emmanuel Macron on Thursday denounced a "pointless polemic" that has flared up after his defence of Nazi-collaborator Philippe Pétain's record as a general in World War I. On Wednesday he declared that a homage to Pétain, who was imprisoned after World War II for heading a pro-Nazi government, would be "legitimate". "I'm telling you quite frankly, our country needs other polemics and other discussions than this one," Macron told journalists on Thursday. On Wednesday, during a five-day tour of World War I battlefields , he defended the idea of a homage to Pétain's role as a "great soldier" in that conflict, despite his subsequent disgrace. On Thursday he stood by his statement. "There was a Marshall Pétain who was one of the great soldiers of 14-18 and you can't erase that, and so I simply said: you can't erase history, we are not the prosecutors of history," he told the journalists. Meanwhile, a presidential palace statement pointed out that the ceremony Macron was questioned about will not, in fact, pay homage to Pétain. It is to take place on Saturday at the Invalides monument in Paris as part of the commemoration of the end of World War I. Initially envisaged as a homage to all the officers who contributed to the eventual victory, it will now be a tribute to the seven marshals of France who are buried at the site. Pétain is buried on an island off the French Atlantic coast, where he was interned after his death sentence was commuted to life imprisonment for heading the wartime government that collaborated with the German occupation . Macron will not attend the ceremony but will be represented by Admiral Bernard Rogel, the head of his personal staff. The president's initial statement set off a storm of criticism and left ministers scrambling to defend him. "Pétain is a traitor and an anti-Semite," tweeted hard-left leader Jean-Luc Mélenchon. "His crimes and his treason are unpardonable. Macron, this time you've gone too far! French history is not your toy." Other left-wing politicians, freemasons and Jewish organisations also condemned it. Pétain's Vichy government remains "an indelible stain on our history", the country's largest freemasons' lodge declared. "The only thing we will remember about Pétain is that he was condemned, in the name of the French people, to national indignity during his trial in 1945," Francis Kalifat of the Crif association of French Jewish groups commented. Socialist Party spokesman Boris Vallaud tweeted that "Pétain cannot be accused of high treason, condemned to national indignity and to death in 1945 and at the same time receive a national homage in 2018. This confusion is an injury to the national memory." But Philippe Gosselin, of the mainstream right Republicans, hailed the "Victor of Verdun" - the bloody battle of 1916 - and said a homage was justified "while recalling that it is absolutely not a homage or admission of weakness with respect to the values he trampled on". Words of comfort for government ministers, who were defending their boss on Thursday. The row was a "vain polemic" that showed that "many of the president's opponents are ready to try anything to try to discredit him", Culture Minister Franck Reister told LCI TV. 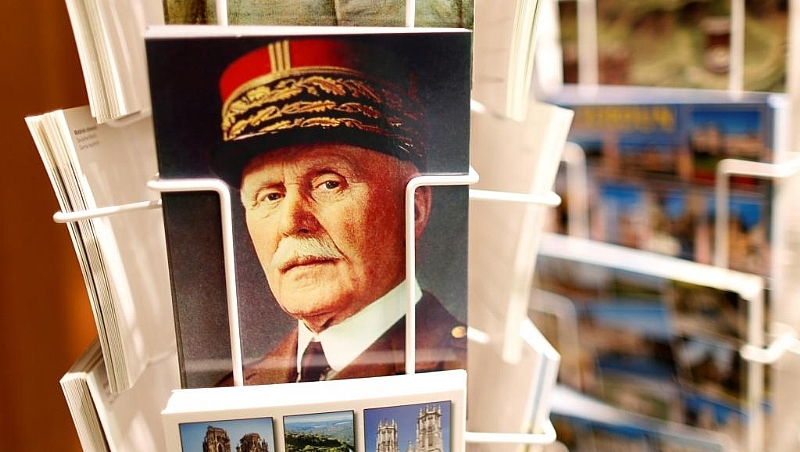 "It's obviously out of the question to pay homage to Marshall Pétain," Education Minister Jean-Michel Blanquer told BFM TV. "On the other hand, when we're talking about 14-18, it is obvious that he played a role. We're not going to be like dictatorships that remove people from photos to make it look as if they never existed." In fact, as Macron pointed out, previous French presidents have paid tribute to Pétain. Despite being his adversary in the war, General Charles de Gaulle laid a bouquet of chrysanthemums on his grave on the 50th anniversary of the armistice in 1968. His Socialist successor, François Mitterrand, placed a wreath there every year between 1984 and 1992, when he stopped doing so largely because of complaints by Jewish groups. Since then some far-right politicians and commentators have defended Pétain's record, as National Front founder Jean-Marie Le Pen did in 2015 when he declared that he had never considered the marshall a traitor. Pacifists and left-wingers have criticised Pétain's role in World War I, pointing out that he was reprimanded by his superior Marshal Joseph Joffre for summary execution of alleged deserters and mutineers "as an example", a practice in which France appears to have outstripped the other combatant nations. As the row raged, the National Assembly paid tribute to two of Pétain's contemporaries. Plaques were placed on the seats once occupied by Georges Clémenceau, the prime minister during the conflict, and Socialist Jean Jaurès, who was assassinated by a far-right activist shortly before it broke out. MPs from all parties except the National Rally (formerly the National Front ) staged a standing ovation in their honour.